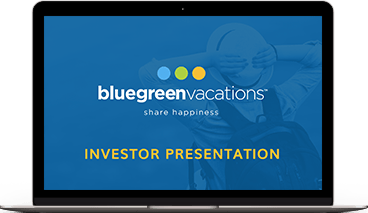 Bluegreen Vacations Corporation (NYSE: BXG) is a leading vacation ownership company that markets and sells vacation ownership interests (VOIs) and manages resorts in top leisure and urban destinations. The Bluegreen Vacation Club is a flexible, points-based, deeded vacation ownership plan with approximately 215,000 owners, 69 Club and Club Associate Resorts and access to more than 11,100 other hotels and resorts through partnerships and exchange networks as of June 30, 2018. Bluegreen Vacations also offers a portfolio of comprehensive, fee-based resort management, financial, and sales and marketing services, to or on behalf of third parties. Bluegreen is 90% owned by BBX Capital Corporation (NYSE: BBX) (OTCQX: BBXTB), a diversified holding company. Bluegreen Vacations trades as a component of the Russell 2000® and 3000® Indexes.